2009 has seen further spread and considerable consolidation of Bombus hypnorum. For the second year running BWARS has collaborated with the Bumblebee Conservation Trust in gathering data, and some 470 records have been sent in over the last few months. The number of occupied grid cells has grown from 77 to 200 this year (almost a 260% increase in occupation). Only 30 cells from which we received data up to the end of 2008 had no repeat records this year. It is interesting to note how rapid the spread has been to the north and east of the initial discovery site. Spread westwards has been much slower and less dramatic. Apart from the records from London and the Home Counties (where the bee has been well established for several years), highlights include the first Welsh records (from Cardiff and Barry) and the sheer volume of records from Norfolk and Yorkshire. Also, for the first time, there have been a significant number of reports coming in of active nests in bird boxes, behaviour that was shown on BBC Springwatch in late May. 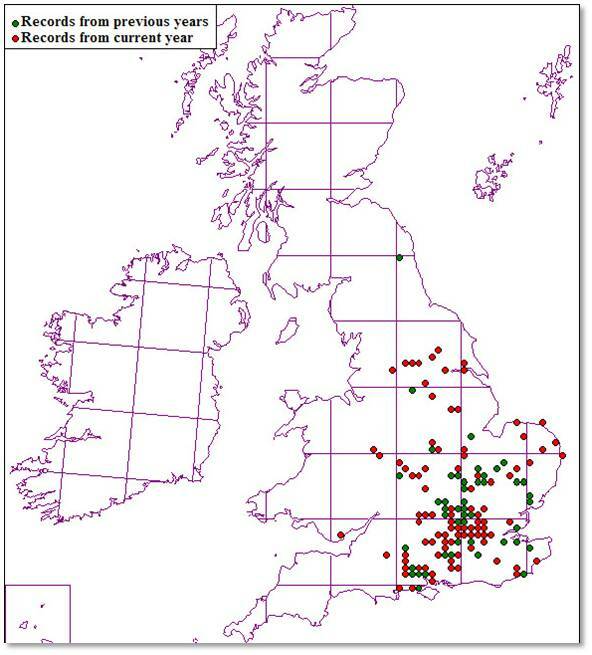 In addition to the information received from BWARS members, data has also come from members of BBCT, and the public via Google searches linked to the BWARS site (backed up with photos), from OPAL (West Midlands), BBC Springwatch, feature articles in gardening magazines, wildlife bloggers, The Natural History Museum, county wildlife trusts and record centres. The system for monitoring B. hypnorum in UK was presented to US biologists at the Smithsonian Institution in Washington DC in June, and has encouraged several of the attendees to consider adopting a similar approach for monitoring Bombus affinis in the US. Stuart Roberts, September 2009 Back to Survey.